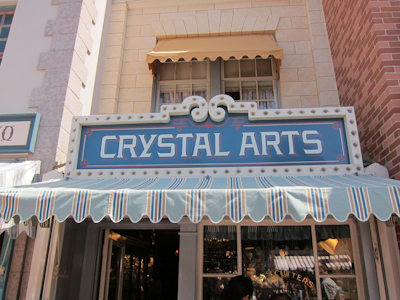 Among the shops on Main Street you’ll find the Crystal Arts shop. Now I’ll be honest with you–sometimes there are things that just make me say “why would you buy this?” and I’ve gotta say, the entire Crystal Arts shop is like that for me. I think perhaps part of the problem is that when I’m faced with that much glass that’s all displayed on glass, I can’t really figure out what I’m looking at. Another thing I think puzzles me is that a large portion of what they have isn’t Disney-related at all. 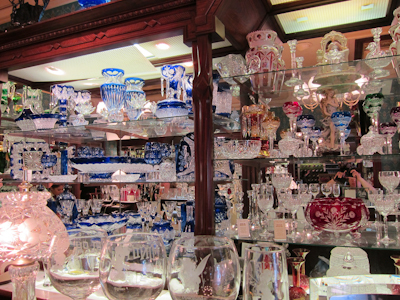 I mean, I can understand maybe wanting to take home a Mickey Mouse wine glass or something, but a cut glass vase? Why come all the way to Disneyland and pay Disneyland prices for that? I guess part of it is that I’m cheap, so if I’m going to buy anything at Disneyland, it better be something clearly indicating that it came from Disneyland, know what I mean? 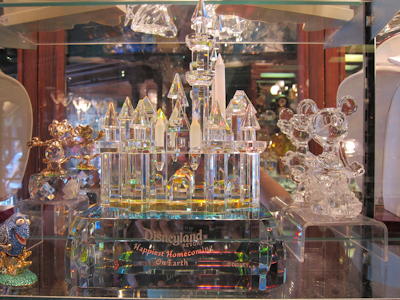 You can buy the castle in glass. I forgot to check how much that cost. They also claim to have glass cutters, though I think that’s just window dressing. I suppose maybe I’m spoiled, because when I think of quality cut glass I think of Waterford, and I have actually taken a tour of the Waterford factory in Ireland not once, but twice. It was very cool. I guess people do buy these things–Crystal Arts isn’t the only place you can get them. I just can’t help but think gee, I’d hate to be there in an earthquake! I remember back in 1979, while visiting Disneyand, my brother and I happened across what looked like a workshop in Fantasyland, near the trance to the catle, there was a half door, open to this workshop and a woman performing mesmerizing feats of magic by blowing glass structures. We must have spent over an hour watching this artisan perform. 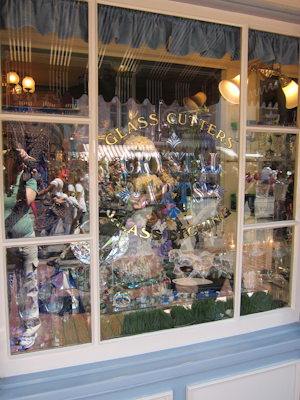 There was a counter with all sorts of glass objects for sale, including glass bells with glass clappers and with mickey Muse etched in the side. I bought a small jar that had a penny inside. there was even a tiny cork that fit into the neck of this tiny jar. 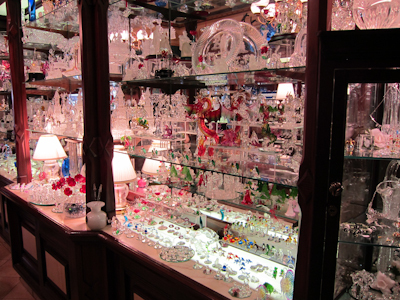 I still have my “penny in a bottle.” Since the Fantasyland refurbishment in 1983, the Arribas Brothers no longer have a glass blowing window, but they do display their swag in a store on Main Street. My friends were given a limited edition, numbered glass sculpture of the rose under glass from Beauty And The Beast. Their sculpture was shattered when it was knocked off the shelf during the Northridge earthquake in 1995. They took the base back to Disneyland later that year and because the plaque with the number (that was under the dome) was still intact, and it was a limited edition, the Arribas Brothers were able to recreate the entire sculpture. for my friends. Their glass sculpture currently resides on a shelf in their home in Indiana, where earthquakes are unheard of. If the world ends, I’m going here first and smashing everything. Enjoy the little things.